Tannoy Precision speaker range official details | What Hi-Fi? UPDATE: The Tannoy Precision speaker range is now on sale, and we have full details on the complete range. Of course, you can already read our review of the Tannoy Precision 6.1 and expect to see some more reviews of the other models in the coming months. The Tannoy Precision 6 speaker line-up includes a bookshelf speaker, two floorstanders and a dedicated centre channel, so you can expect to see a Tannoy Precision 5.1 system in a dealer near you. 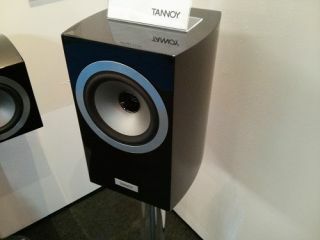 We first saw the range at the High End Show in Munich last year and after a soft launch at the end of last year, Tannoy is ready to make a little more noise about the new speakers. The Precision 6.1 bookshelf speaker is set to retail at around £899, the standmount Precision 6.2 at £1699 and the larger standmount Precision 6.4 at £2199. There's also the Precision 6C centre channel, yours for around £1200. Tannoy's newest range features the company's latest 6in dual concentric drivers, curved cabinets for reduced resonance, and a range of finishes. The new 6 inch (150mm) version of Tannoy’s Dual Concentric driver with WideBand tweeter technology claims "exceptional accuracy with extremely low colouration". The flagship Precision 6.4 combines this driver with a matching 6in bass driver, and the cabinet is loaded with a pair of balanced-mode auxiliary bass radiators, with Tannoy claiming higher efficiency and deeper, tighter bass as a result. The smaller Precision 6.2 has a rear port, plus a 6in Precision Dual Concentric driver and a matching 6in bass driver, while the stand-mount Precision 6.1 uses a 6 inch Precision Dual Concentric driver in a compact, ported cabinet. Each speaker also features Tannoy’s latest 1in (25mm) titanium dome WideBand driver with the company’s proprietary Tulip Waveguide technology. All the speakers are available in high gloss black finishes, while the 6.4 and 6.2 are also available in either a gloss or satin dark walnut finish. The 6.1 is also available in the walnut finish. The full Tannoy Precision 6 range is on sale now.